DEFINITION: A "Mouldy Fig" is a person who likes to play old jazz. TERMS OF ENGAGEMENT: We're easy! We have played on stages, buses, trains, boats, truck beds, ice rinks and swimming pools. If you want us - we'll play! Look at our photos, add a few musicians and a singer or take a few musicians away to match your occasion or budget needs. Just contact us for consultation and prices. INTRODUCTION - MOULDY FIGS: Jim Field started the Mouldy Fig Jazz Band in 1959 when he was a junior at Main Township High School in Parkridge, Illinois. A "mouldy fig" is a person who studies and plays old jazz. This term came out of the Tommy Dorsey Orchestra, as was told to Jim by author Studs Turkel. Jim's exposure to Chicago style Jazz in the late 50s connected him with Mike McKendrick, a banjo player with Louie Armstrong. Mike taught Jim how to play the washboard. Jim still plays that same washboard that he bought for $1.50 in 1959. Jim Field relocated to the Twin Cities in 1970 as the director of the YMCA Street Work Program, and continued his musical hobby. He originally formed the Minnesota Mouldy Figs to perform at Fiorito's on 6th and Sibley in St. Paul in 1973. 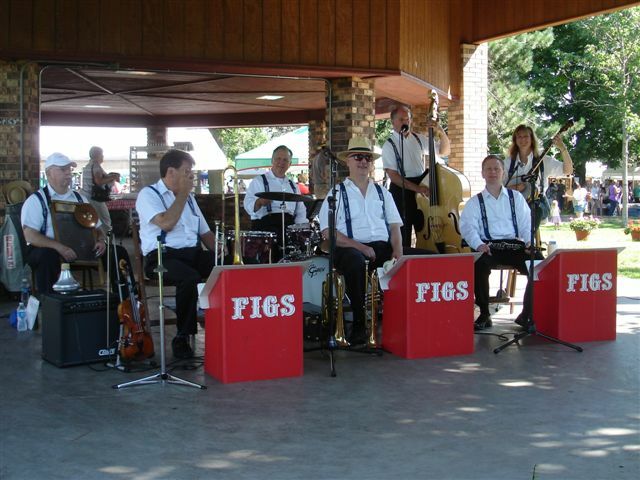 The Figs played there and the Lower Levy Lounge for eight years, and have played at the Bungalow in Lakeland, MN for another eight years and currently play at the Bungalow Inn and Shamrocks in St. Paul. Professional Recordings: The Figs have three professional recordings: "Have Yourself a Mouldy Little Christmas", "Figs Live at the Bungalow", and "Never Trust a Band Under 30". The Mouldy Figs love to play music and have fun! Ideal for Parties, Dances, Weddings & Bashes.